The clinician hub creates a more dynamic, functional space that allows for a greater range of work modes. This hub is an ecosystem of different spaces for different activities: collaboration, focused tasks, teaching and learning, and quick social exchanges. In the era of big data and healthcare, there’s one buzzword at the center of every conversation: privacy. From HIPAA to telemedicine to electronic health records, concerns about privacy are at fever pitch. But too often, these conversations are centered exclusively around patients and health information technology, ignoring the importance of providing clinicians with the privacy and space they need to safeguard information and maintain their own wellbeing. Clinicians of all levels find themselves stretched thin, working in spaces that don’t suit the dynamic and changing roles they must switch between during their shifts. Room to share patient information. Room to focus on tough problems. Room to relax and recover. Most clinician spaces today don’t offer this diverse ecosystem of spaces—instead relying on the traditional nurses’ station. But nurses’ stations are frequently noisy, busy spaces that don’t offer a place for individual focus or private conversations, increasing the risk for costly errors. Historically, hospitals have been environments that hold little regard for clinician privacy. Yet this is a problem not only for those clinicians and the patients they serve; it is also a problem for the hospital’s bottom line. There is extensive evidence that noisy, hectic environments with no place for focus and escape result in poor performance and absenteeism. And as the use of telemedicine and other remote video collaboration tools increases, clinicians will require more private environments to share patient information. It’s time for us to better support those who deliver care. Hospitals must take action to protect the privacy needs of not only their patients—but also their staff. As the primary care shortage continues to result in an influx of nurses, physician assistants, and other team members delivering care on the front lines, creating spaces for hospital employees to step aside and find privacy will require a more thoughtful and concerted approach. 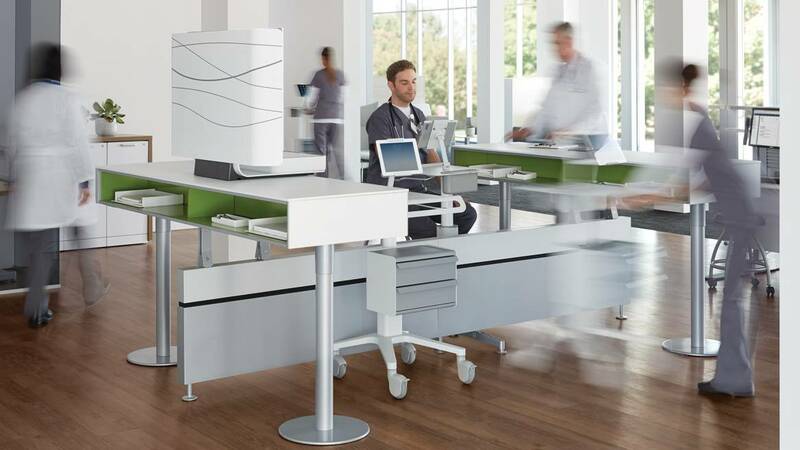 By studying clinicians’ needs and behaviors and understanding their everyday workflows, Steelcase Health offers an innovative new approach for improved clinician efficiency, accuracy, satisfaction and overall wellbeing. It’s designed to empower clinicians, connect them to technology and to each other and, ultimately, to create more connected patient care. And privacy is a very important part of the story. Whether it’s updating electronic medical records, conducting patient research, trading information during a shift change or simply taking an important personal phone call, private getaways humanize the healthcare work environment and improve clinicians’ sense of wellbeing and ability to focus as needed. 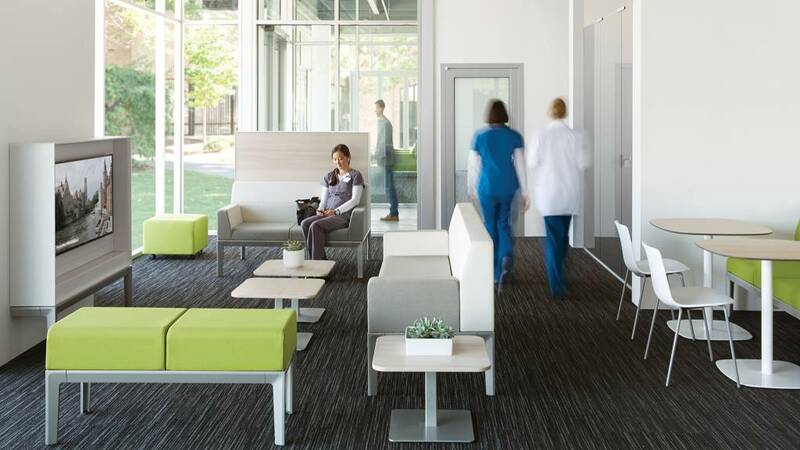 Steelcase Health has developed applications for clinical and administrative workspaces with three core design principles in mind: to humanize the work experience, and to empower and connect clinicians. Privacy needs are inherent throughout, from individual solitude to quiet, small-group discussions to retreat spaces for staff—a range of settings to meet individual, group and organizational needs. “When the organization provides spaces that support the wellbeing of their employees, it empowers the staff to take care of themselves,” Kelly says. “This gives nurses the chance to say that taking care of themselves is important. Since they’re feeling recharged and rejuvenated, it’s easier for them to encourage their co-workers to take a break and offer to cover their patients.” When the organization provides a human-centered workspace that recognizes people’s privacy needs, cultural changes naturally follow and individuals find themselves adopting new behaviors. By design, it all adds up to enhanced provider wellbeing, satisfaction, accuracy and patient care. A reimagined nurses’ station creates a more dynamic, functional space that allows for a greater range of work modes. Unlike a traditional nurses’ station, this hub is an ecosystem of different spaces for different activities: collaboration, focused tasks, teaching and learning, and quick social exchanges. The hub also provides easy sightlines to patient rooms so clinicians can maintain awareness of what’s going on around them. Multiple points of entry and exit make movement fluid. Technology is thoughtfully integrated throughout all workspaces in recognition of its increasing importance in healthcare. As more and more clinicians rely on mobile devices such as tablets, the hub features a multi-port charging station that provides secure support, so expensive equipment gets dropped less frequently, recharged often and used to share more patient information. Adjustable monitors and foot railings encourage personalized work styles and postures, providing physical comfort and relief for aching feet. A clinician retreat near the clinicians’ hub provides a combination of social and private spaces that can include a small kitchen, eating area, media bar, personal lockers and a separate enclosed respite area for one person. For clinicians, privacy can’t mean physical distance from patients. Charge nurses and nurse managers often express a need to be able to move quickly between private and patient-facing spaces. Maintaining situational awareness and being able to seamlessly transition can make all the difference when it comes to responsive patient care. 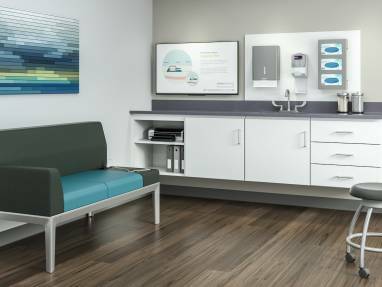 A nurse enclave accommodates clinicians’ need to do focused work while maintaining a close watch on what’s happening on the floor. With visual and acoustical semi-privacy, it’s an ideal space for charting and other heads-down work, as well as phone calls or videoconferencing. Staffers can see through glass walls, encouraging impromptu conversations and questions, but an enclosed configuration assures periods of privacy as well. In addition to individual spaces, clinicians need quiet collaboration spaces where they can share digital information and consult with others, including via videoconferencing from different locations. Given recent data that telemedicine will grow at a rate of almost 20 percent every year, creating space for it to be successful is paramount. The new footprint includes space for an enclosed telepresence room, complete with high-definition videoconferencing, creating an optimized setting for physician consultation and collaboration. Teams and specialists in multiple locations can now share vital information in casual, quick, informative sessions. Seated-height chairs allow for longer meetings to generate and evaluate ideas. Enhanced communication leads to more connected care, and better outcomes. The signature spaces of the healthcare landscape are changing, providing more efficient, versatile and human-centric spaces that focus on clinician wellbeing. Not surprisingly, clinicians tend to place their own care at the bottom of the priority list. “We need to support them by understanding the context of their work and giving them choices that fit instead of telling them to walk five minutes down three different corridors to the break room,” Kelly says. “Most will tell you they can’t leave their unit that long.” A better alternative is a strategically and conveniently placed retreat near the clinicians’ hub. 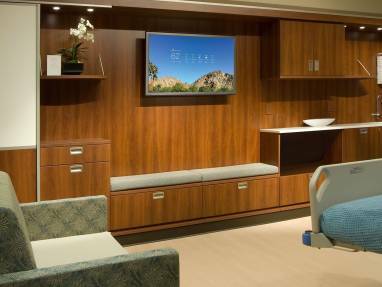 A combination of social and private spaces fills the respite area, including a small kitchen, eating area, media bar, personal lockers and a separate enclosed respite area for one person. These touchdown spaces encourage balance and rest, so patients receive better care, staffers are less prone to burnout and breaks become all that they’re meant to be. Healthcare practitioners see some of the most joyous and devastating moments in people’s lives, creating an emotional roller coaster. Sometimes, it’s necessary to move into a quiet space after a stressful experience, or just to take an urgent personal phone call away from the hubbub of the open work environment. An individual enclosed enclave adjacent to the clinicians’ hub allows workers to take a few moments to re-center themselves or handle personal matters, reducing their stress load and the risk for medical errors. The old ways of working in a healthcare setting are giving way to smarter, more human-centric ways that emphasize clinician wellbeing. 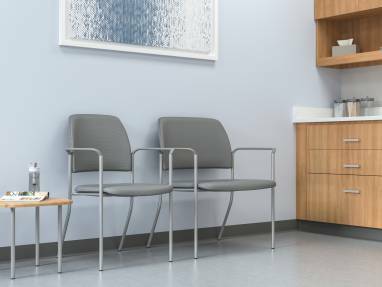 The signature spaces of the healthcare landscape are changing as well, providing more efficient, versatile and private spaces than the old nurses’ stations. As healthcare continues its evolution towards consumer-driven models of care and value-based reimbursements, forward-looking hospital leaders will transform their spaces to accomplish these new market requirements. These leaders will remember that privacy is about more than just patients’ health records; it’s about the basic human need for choice and control. The benefits of providing privacy for healthcare workers are already clear, from fewer medical errors to increased staff retention and better patient care.